Granted, this is less a quote sort of a quote as it is a matter of getting the record straight. Time and again, those who introduced slavery in America are given a free pass. Moreover, modern day activists attempt to state our heritage is one of slavery. Yet, if only these loud mouths would actually dig in and learn real history, they’d know that Americans had fought against this abhorrent practice and that our early attempts to limit importation were stopped by the British crown. It’s time, especially since this is Black History month here in the US for the facts to be put straight. 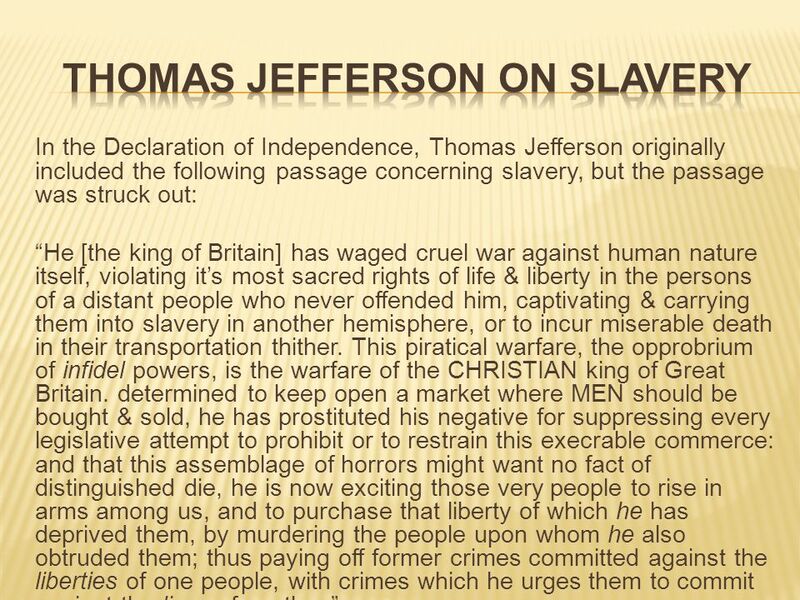 This entry was posted in First Principles and tagged Declaration of Independence, First Principles, Human Nature, King George III, Life and Liberty, Sacred Rigth, Slavery, Thomas Jefferson, War. Bookmark the permalink.